On May 19th 2018, on a warm afternoon, people gathered at Woodcrest United Methodist Church in Lumberton, Tx. Skys the Limit Production was also there and given the pleasure of filming Lairen and Jake’s big day. Their relationship began in the little city of Lumberton, Texas, where Jake and Lairen had always been acquaintances growing up. They knew of each other as one does growing up in a small community. In August of 2015, Lairen received a text message from her friend Fay. She explained to her that there was a nice, respectable man whom she knew, that was single and looking for a lady of equal measure. Lairen befitting the description of a lady, seemed piqued in interest, wondering what this possible suitor looked like. As her eyes fell upon the picture of the man inquired, she was seemingly shocked to find out it was Jake. After careful consideration, she decided to not pursue him, fore they grew up together in church yet, they never seemed to connect in that way. They were five years apart and circled around different crowds leaving seldom opportunity to get to know one another. On the day of their wedding, Lairen looked very much like a princess. Her long chestnut locks falling gracefully down to her waist, her fair skin glowing warmly, and of course, her dress. It was like one you would see in a fairytale; big bustling cream fabric hemmed to detailed perfection. She was the image of princess bride. Jake worked a navy button up accompanied by a brown vest almost matching his bride’s beautiful shade of hair and khaki pants. He resembled like Lairen, a character from a fairytale. While Lairen prepared for the day, Jake surprised his princess with a wedding cake flavored snow cone. The couple together received another special wedding gift; a homemade swing with their names and wedding date engraved into the wood in the front. As the wedding began and the crowd hushed to a silence, Lairen entered escorted by her father. Upon reaching the alter a Skys the Limit Production Film began. It was a video made for the bride and her father about how he saved his daughter’s wedding dress from the flood during Hurricane Harvey last year. The crowd was overcome with tears as they watched. 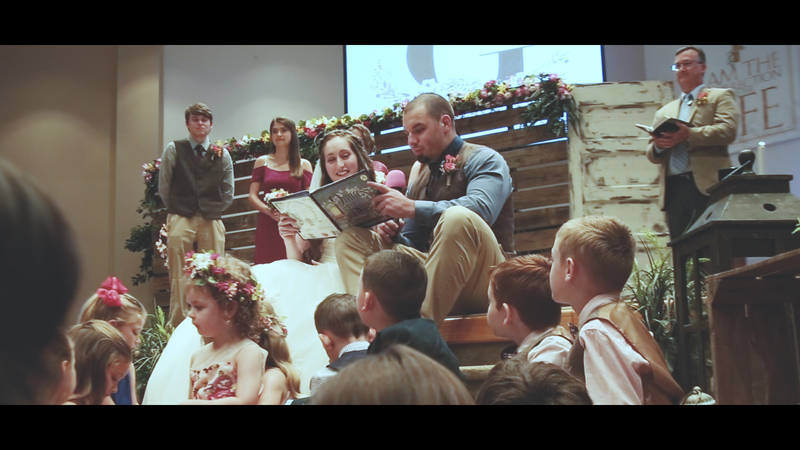 In conclusion to the video from Skys the Limit Production, Jake and Lairen requested all the children to come up to the stage and sit with them as they read, The Princess and The Kiss. A tale of love was woven and the children listened, hanging on every word. No doubt the scene displayed moved their hearts with the notion of love. The couple then began their vows. After the ceremony, the crowd moved to the reception where they had wedding cake along with coconut cream pie. The music was light and catchy as the couple danced and mingled with the crowd. The laughter and banter of conversation filled the air. Just before dusk the crowd was ushered to the doors while the couple changed into more comfortable clothes. They walked proudly hand in hand as loved ones blew bubbles all around them. Giggles and goodbye were emanating from the crowd as they passed. Lairen sported a blue jean jacket saying, “Mrs. Glenn” on the back. Her hair swishing gently as she gave Jake one last kiss for the crowd before the two left into the evening as husband and wife. Today Jake works for Mometrix Test Preparation, in his free him he likes to play Ultimate frisbee or volunteering for his community and church. Lairen works at Mr. Rooter Plumbing in marketing. If she’s not there she’s at Lamar State College Orange, working towards her graduation this coming December. She is also active member of her church. A special thanks from Skys the Limit Production for letting us capture and be a part of this beautiful union, and being able to have the honor of recording Lairen and her father’s story.